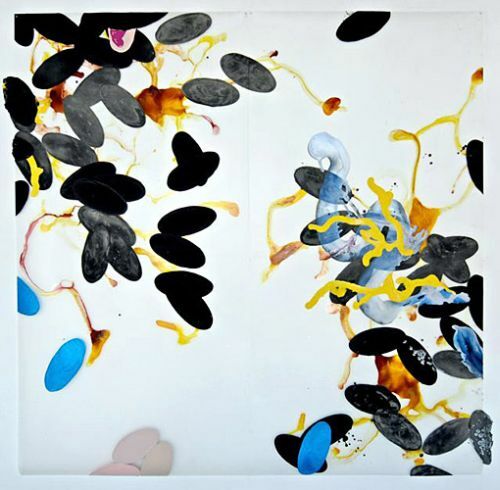 Ever since Bay Area painter Nellie King Solomon had her first solo show in San Francisco fresh out of graduate school in 2001, her work has met with positive reviews, even from the hard-to-please SF Chronicle art critic Kenneth Baker. (She’s also a three-time SECA nominee, up again for the award this year.) The final words of his glowing appraisal of that first show also issued up a challenge that many shared: “Her show is a powerful debut that will be hard for her to follow.” Solomon laughs about the gauntlet Baker threw. Her reaction? “I was like, you do not know who you’re messing with.” Almost a decade later, the work is stronger than ever. Solomon makes luscious, ephemeral large-scale abstract paintings on Mylar, addressing issues of space and environment, control and movement. They are created in her light-filled Hunter’s Point studio, on a table using handmade tools or sometimes just gravity to maneuver the paint. The imperfect surface contributes to the creation. 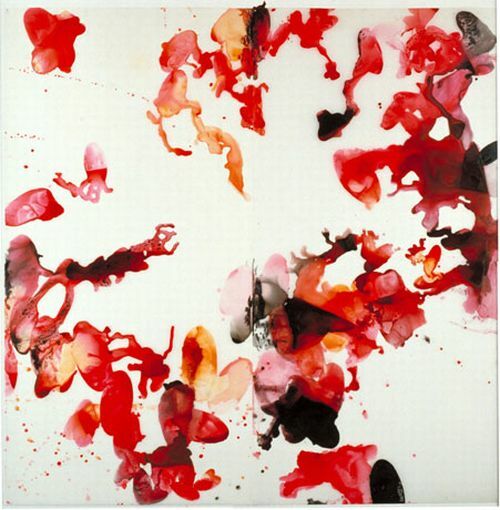 Her early works were bright and fluid; puddles and rivulets meandered over the opaque surface resulting in meditative, organic paintings. 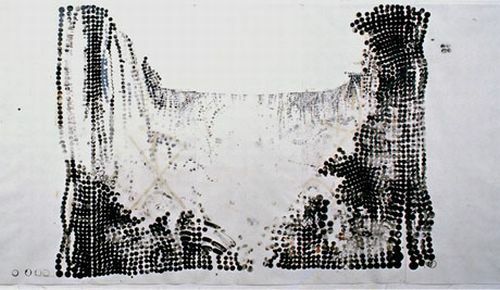 On some, oval marks stamped with one of her homemade wooden tools, are also evident, harkening back to the point at which Solomon started her artistic journey–with the dot. With this new work, Solomon is beginning to move. Whereas past paintings were almost self-created by the undulations of her work surface, in these, Solomon is the primary guiding force. A common feature throughout are large, thick rings that don’t quite close; the shape is created with a graceful full-body gesture, a nod to Solomon’s early training as a dancer. “I have hidden that strong arm behind my back for a long time,” she explains. “I’m just letting it come out. That’s one reason I work so large. I want it to be to some degree out of my control. If it’s too big for me to be able to handle, it keeps me from getting glib. It keeps me a little scared.” Solomon’s increased boldness is also evident in her changing palette. Pretty pinks, reds, and yellows of the past are replaced by toxic neon oranges and magentas and dark browns, black, green, and blue mixed with glitter; the edges, caked with soda-ash, have a corroded texture. The influence of Solomon’s interest in the environment, and the increasing degradation of it, is increasingly obvious. Gone are the delicate niceties of early work; these paintings are brave, brazen, and intense. This is not about Dave Eggers, the best-selling author and founder/editor of McSweeney’s. Nor is it about David Byrne, the bike-rack designer and lead singer of the Talking Heads. This is about visual art and the two-man show that currently features work by both Eggers and Byrne at San Francisco’s Electric Works (on show through August 21). The first, and last, impression of this show is delight, with a dose of idiosyncrasy. It’s a good summer offering: light and witty, even quirky hip. Eggers’s contributions take up the larger space of the gallery, while Byrne’s work is featured in the smaller side-room. The work shares a clean aesthetic; both present drawings on paper (Eggers uses China marker, Byrnes, graphite) that incorporate use of text. 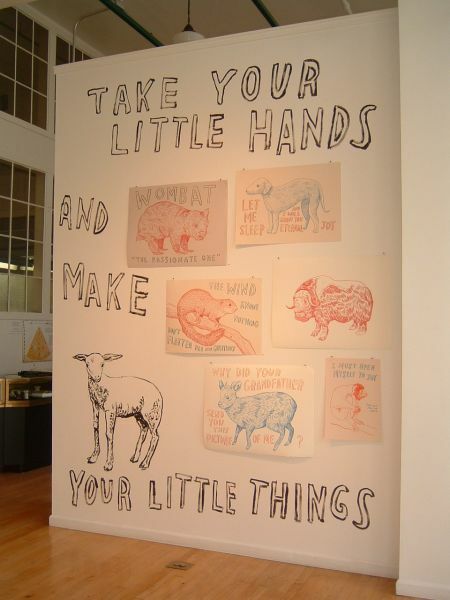 Eggers’ space also features the same words and images painted large on the walls. Color is limited — black, white, orangey-red, and grey-blue. This is Eggers first solo art exhibition, and it’s a nice start. 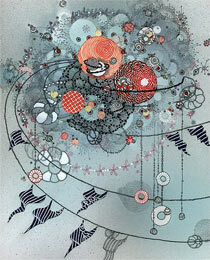 But this is not the first time Eggers has made visual art (though this his most recent work; all pieces are 2010). He studied painting and art history at the University of Illinois and worked as an illustrator, cartoonist, and designer before switching over to the written word; he didn’t think he could make art a career. 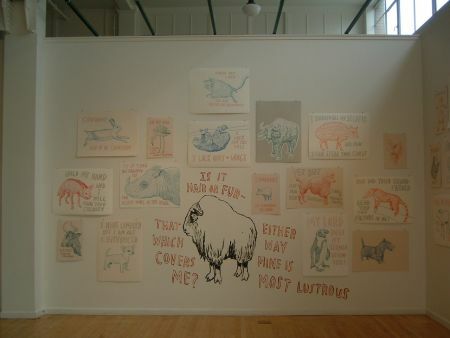 Each piece in the show features a detailed drawing of an animal against a blank white or tan of the paper surrounded by text; the animal images are based on old photos, and the text is Eggers’ idea of what that animal might be thinking. Appropriately, the animals’ personalities are introverted, standoffish, or a little sad. The artist’s graphic/illustrative influences are clear; the uncluttered, bold layout with large lettering is reminiscent of political propaganda posters — nature illustrations meet Shepard Fairey. The works on paper are hung all over, a loose salon style, and broken up by the large wall works. Animals are everywhere. 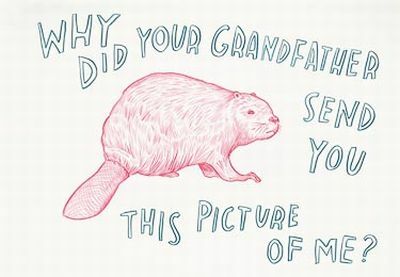 A beaver poses the question: “Why did your grandfather send you this picture of me?” A rhino states: “It is time you thanked us for deeds done in thy name.” A bull notes: “You will never have a successful long-distance relationship.” And a bat boldly says: “Go to the city in your car.” In several cases, the same text is used with a different animal or the same animal is paired with different text. The phrases are humorous, at times poignant or advisory, though several do feel like inside jokes or personal observations we’re not let in on. 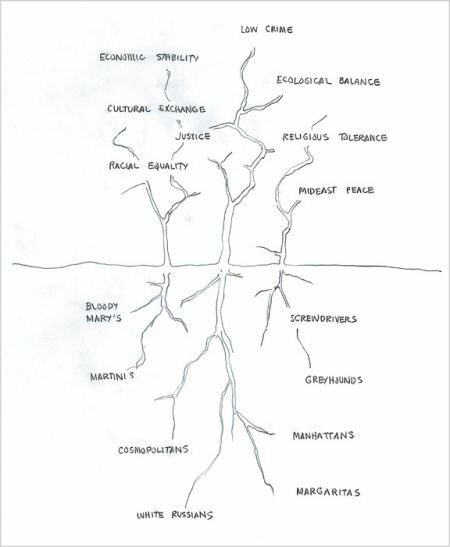 Drawing/diagrams (mostly) in the form of trees, which both elucidate and obfuscate the roots of contemporary phenomena and terminology. Sort of like borrowing the evolutionary tree format and applying it to other, often incompatible, things. In doing so a kind of humorous disjointed scientism of the mind heaves into view. In The Performing Arts, roots of One-Man Show, Dance Theater, Revival, Fringe and other performance-associated designations grow branches of Bankers, Designers, Bureaucrats, Politicians, Career Military, and other professions. 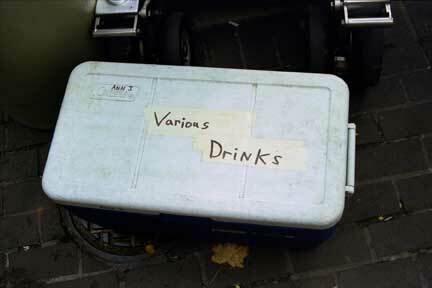 The Influence of Mixed Drinks features roots of various popular cocktails and branches of idyllic world situations: Racial Equality, Religious Tolerance, Mideast Peace, and the like. The shows together provide insight into the creative thought processes of these contemporary cultural influencers. Linear and organic structures complement each other in this two-person show of sculpture and works on paper (on view through September 11, 2010, at Johansson Projects in Oakland). There is a shared lightness to the works, giving the exhibition an overall ethereal, meditative feel. The exhibition comprises two sculptures by Jana Flynn — one wall mounted and the other a site-specific, floor-to-ceiling work that spans the back of the gallery — and several ink-on-paper works of various sizes by Jill Gallenstein. Juxtaposed next to these are highly detailed and gorgeously colored works by Gallenstein. Rounded objects, starbursts, and other creations from the artist’s imagination group together, string out, and sometimes regroup across or down the paper; the backgrounds often feature subtle washes of color which enhance the atmosphere. The intricacy of these works cannot be overemphasized; they are stunningly rendered, each shape decorated with dots and lines to the tiniest degree. Up close, they are a wonder of obsessive attention; far away, they present beautiful, fluid compositions in bright, dramatic palettes. Considering these two artists together, Flynn’s sculptures bring out the taut structure in Gallenstein’s work; Gallenstein’s seemingly amorphous works highlight the lyric aspects of the three-dimensional pieces. If these works hold their own individually, seeing them side-by-side mutually enhances their impact — a reminder of how the experience of an artwork is profoundly affected by its surroundings. 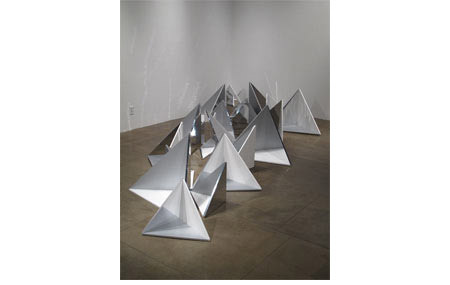 In his solo exhibition at Marx & Zavattero (on view through August 21, 2010), Los Angeles-based artist Timothy Nolan delivers contemplative sculpture that is all clean geometric forms, a subtle palate of silver, black, gray, and white, and various surface treatments – mirrored, reflective, flat. Nolan continues his investigation of patterns, repetition, and systems, both made and natural. The work easily draws the viewer into the complexity encompassed, including the exploration of visual perception and construction of illusory versus real space. Evident throughout is the influence of minimalism and cubism; the artist is also inspired by craft and op art. The exhibition features floor and wall sculpture as well as works of silver metallic paper on panel and other two-dimensional pieces. The centerpiece – both literally, as it takes up a large space within the gallery, and figuratively; it’s enchanting – is the twenty-foot-long Pitch. Comprising more than twenty triangular pieces of various sizes, with several of the surfaces mirrored and reflecting off of each other, the work evolves into endless shards and crystalline structures, elegantly getting to the heart of Nolan’s interests. In the wall sculpture, “Stack” – which is also made up of a series of over twenty non-identical hard-edged shapes, these composed of printed vinyl on aluminum – geometric shapes in five gray-scale hues also play with our comprehension of light and shadow and the shaping of space; the piece appears to be more three-dimensional than its flat surfaces really are. While Nolan’s artwork overall is hard-edged and calculated in appearance, it’s not cold. This is meditative work that we not only see but experience. I came across a quote from John Waters in the current issue of Juxtapose magazine that neatly threaded together three things in a way I hadn’t previously realized: What I loved most about his last solo exhibition (titled “Rush” at Rena Bransten Gallery, San Francisco, May 27 through July 10), one of the primary draws I have to looking at art, and why I’m also so drawn to the current solo exhibition of work by Maira Kalman, titled “Various Illuminations (of a Crazy World),” at the Contemporary Jewish Museum (CMJ) in San Francisco. This is why I so loved Waters’s recent series of photographs, “Pecker Still Life,” which debuted in “Rush” and depicted unremarkable sights behind the scenes of movie filming — bits of the crew’s everyday life — as well as the piece “Shooting Script”, a photo of a grid of nine pads of yellow lined paper with all the pages ripped off and only the cardboard left. These are common objects with great stories. 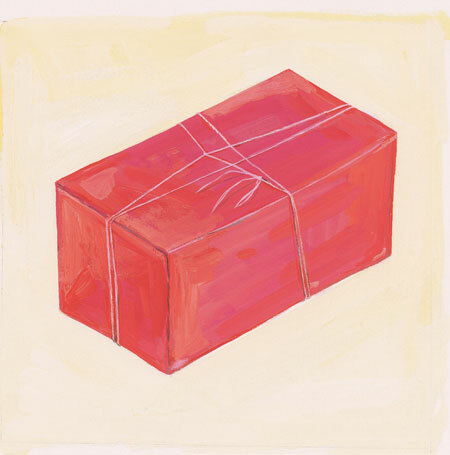 New York artist Maira Kalman takes this elevating of the everyday even further: She’s turned just about anything in her world — from rubberbands, shoes, a candy bar, and a single pink present to hotel rooms, a found couch, or a dream — into artwork. “Basically I get paid to be myself,” Kalman says in a quote from one of the show catalog essays, “and for my imagination.” And what a joy. Kalman’s work is most familiar outside of the context of the fine art world. She’s long been an illustrator for the New Yorker — having created many covers — as well as twelve children’s books (most of which she either wrote or co-wrote), the first of which, Stay Up Late, was a collaboration with Talking Heads front-man David Byrne. She’s written and blogged for the New York Times, has worked on a set for Mark Morris and designed with Isaac Mizrahi and Kate Spade, among other projects. She is also a photographer and embroiderer. 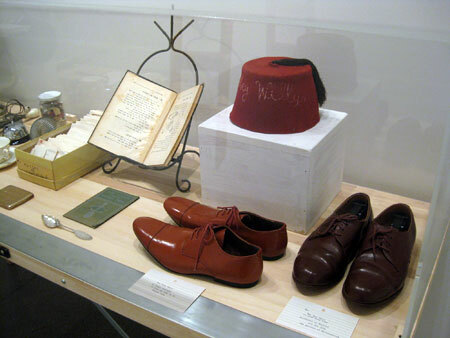 This, her first solo museum exhibition, is a retrospective covering thirty years of Kalman’s work and also includes an installation of objects from her home and studio; it premiered at the Institute of Contemporary Art at the University of Pennsylvania earlier this year, will be on show at the CMJ through October 26, and then travels to the Skirball Cultural Center in L.A. and The Jewish Museum in New York. Kalman is not a formally trained illustrator or painter, but that’s not to say her pieces are uninformed by the art world. The work is layered with cultural and art historical references from Matisse and Chagall, Dadaism, Surrealism, and Futurism. Fashion, travel, and design also figure greatly. In addition to illustration, an arena Kalman has had a profound impact on is design; she was very influential in the work of her husband Tibor Kalman (now deceased), who founded M&Co, a firm that is credited with changing the world of contemporary graphic design. Among other projects, M&Co created Bennetton’s Color magazine. 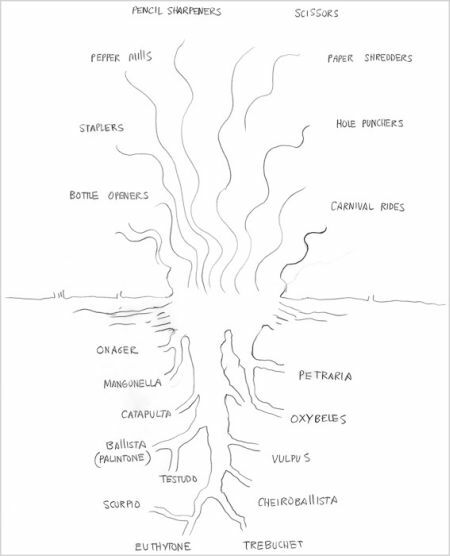 This is the very heart of Kalman’s work, and why we heart it so much. Not only do we share her love of what she presents to us, we begin to see the love-worthy bits of life’s art we unattentively pass by every day.